When I look back, through a fog of nostalgia, at my own religious upbringing, it all seems like a harmless adventure. In rural Indiana in the 1950s we knew that religion was a great benefit to mankind; worshipping God was the decent thing to do, as was telling the world the good news about Jesus. It was a sheltered perspective. My mother was a voracious reader, and everyone loved the local librarian, but had there been a conspiracy? Or was it just negligence: No one bothered to tell me about Thomas Paine, Robert Ingersoll, H. L. Mencken—or even Bertrand Russell, who, fifteen years before I was born, had delivered his famous Why I Am Not a Christian lecture. Criticism of Christianity was nothing new, but we were in a little cocoon. The 1950s are so long ago and far away: withering criticism of Christianity is now mainstream and in-your-face. 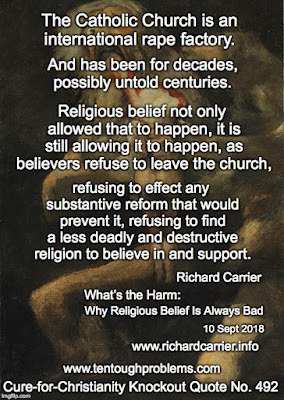 In my article here last week, in which I commented on David Eller’s essay “Love Your Enemies, Kill Your Enemies” (in the Loftus anthology, Christianity Is Not Great), I made reference to Richard Carrier’s recent essay, What’s the Harm: Why Religious Belief Is Always Bad. This prompted one of the Plodding Apologists (there are several who show up here at the DC blog), once again to rise to the defense of ancient superstition. 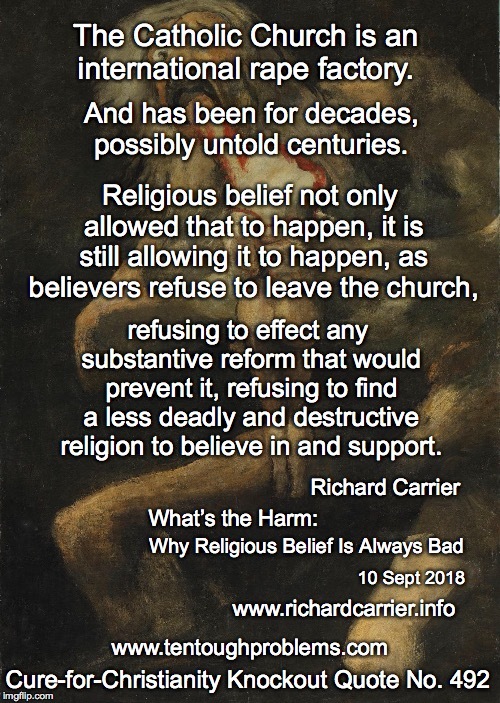 The Carrier essay is a 5,700-word tour de force analysis of the damage done by religion, covering a wide range of issues and including three dozen links to articles, books, and other resources. If you’re looking for a quick guide to this topic, bookmark Carrier’s essay for handy reference. And if you want to make a dint in his arguments, the standard apologetic clichés don’t work. Carrier is faulted by the Plodding Apologist for not “putting his own worldview under the microscope.” This is a diversionary tactic; we can understand very well why someone pleading for Christianity wants people to be suspicious of Carrier’s world view—and doesn’t want them to look too closely at Carrier’s data: His case against religion is so massive. And, of course, what a joke. His own Christian worldview that the apologist touts—which he is confident is ‘close to correct’—fails to match countless other Christian worldviews. Just which Christian worldview is the right one? To his credit, he disassociates himself from Christians who despise gay people (those who, as he puts it, advocate the ‘mass murder of gay people’); but in American culture today, it is Christians who lead the anti-gay movement, driven by their confidence in a vicious loving God (who sends hurricanes and plagues to punish tolerance of homosexuals). And why are we not surprised that the apologist hauls out another cliché? Namely, atheists are—wait for it—just as bad as Christians. That Christians are even in this race for “who does the most evil” is a damning admission—and says a lot about the nastiness in their scriptures that incites them to act on their most evil instincts. So many severely damaged, evil people have done really bad things, not on ‘behalf’ of atheism, but precisely because they are severely damaged, evil people (whom, it could be argued, God has neglected to heal). But religious enthusiasts (they even don’t have to be zealots) are motivated by the belief that they act on behalf of a higher power. And that, truly, is very dangerous. Our clumsy apologizer seems to think he can bluff his way through with shallow nonsense: “the biblical Christian worldview.” Just what is that? Christians can’t even agree on it. “A worldview that is truly influenced by the Bible.” What a frightening thing to contemplate, with Yahweh rampaging through the Old Testament and then his son Jesus preaching upheaval (e.g., see Mark 13) and eternal punishment. A few feel-good texts don’t outweigh this barbarity. The apostle Paul knew that God’s default emotion was wrath, and zealously assured his followers that Jesus would descend through the clouds to establish his kingdom on earth. Worldviews based on these deeply flawed ideas are even now a clear and present danger, because they have advocates in positions of power. Finally we are told that Carrier is “not very objective”—that his essay is “a propaganda piece, a broadside.” Well, that’s one way to respond when you’ve been hit with both barrels. This is another attempt at diversion, a weak plea for dismissal because there’s the taint of subjectivity. But there is so much substance in the Carrier’s essay; even readers who may be put off by his deep distain for Christianity can set that aside, as they ponder his arguments and research the leads he provides. Just a few days ago Pope Francis was ridiculed heavily for his claim that the devil can be blamed for the woes of the Catholic Church. How many of the gullible nod in agreement, “Oh that must be it”? I have posed the question several times recently, “Why isn’t membership in the Catholic Church down to zero by now?” But that’s not a mystery: folks stick with the church because of the firm grip of superstition, and confidence that their clergy, sinners though they be, know the mind of God. Carrier cites, for example, the excommunication of a nun at a hospital. She had authorized an abortion for a 27-year old mother of four whose life was in danger. The bishop who kicked her out declared, “The mother’s life cannot be preferred over the child’s.” This from the very mind of God—or so say the Catholic bureaucrats. Are we to fault Carrier for any lack of objectivity here? “Ordinarily, a man who would callously let a woman die and orphan her children would be called a monster; this should not change just because he is a cleric.Even just the idea of giving enemies of the people a ‘pass’ merely because they profess to be pious or clerical, is a threat to society that must end. But worse is the very production of such vile beliefs. Kill moms? Really? And that’s but one example. How could he say such things about Jesus? Here’s the challenge I put down to all Christians: read the gospels with a big pad of paper (or excel spreadsheet)—and an open mind—and record the Good Jesus verses in one column, and the Bad Jesus verses on another. A third column is also a good idea: the Jesus verses that are confusing and ambiguous. I get so weary hearing about how good Jesus was. “[This] is precisely how every wrong person on earth justifies screwing themselves up and screwing the world over. It’s exactly the worst thing to believe, totally hostile to any effective methods of rooting out error and discovering the real truth about anything.” And from this flows the huge catalogue of evils that Christians actively and aggressively support…in the name of Jesus and his love. Christianity cannot be redeemed because it is firmly anchored to ancient worldviews that have been falsified time and time again. Of course, there are a billion believers who balk at critical thinking because magical thinking is much more fun—and hey, heavenly rewards can’t be jeopardized. The invested Christian bureaucracy, taking no chances, maintains its stables of Plodding Apologists who come up with all the right answers. Except, of course, that they don’t. The Cure-for-Christianity Library is here.